Drago 123 (Darco out of Beauté de la Vie) Sold at Holstein Verband Elite Riding Horse Auction! We are thrilled to announce that one of our foals, Drago 123 (Darco out of Beauté de la Vie) born in July 2012, was sold on the Holstein Verband Elite Riding Horse Auction in November 2017 for €50,000! Drago has the spirit and instincts of a true show jumper, giving the rider great feelings of confidence because of his excellent scope. 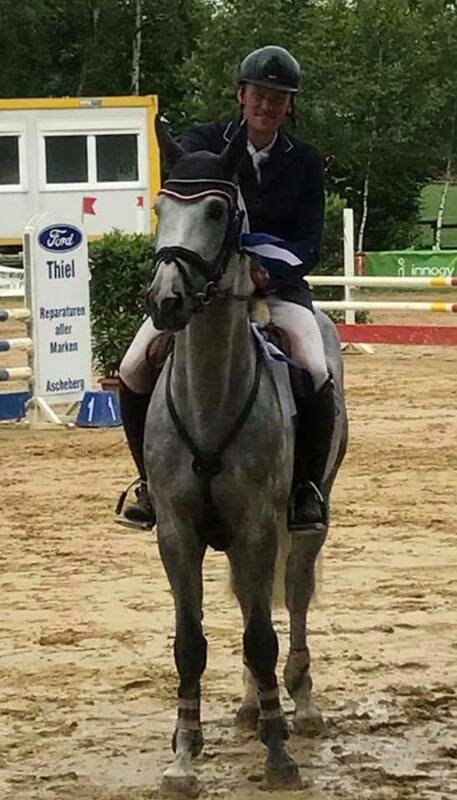 He won the final of the Lake Arena 5 Year Old Tour, rode by Mario Maintz. He comes from an impressive line: his third dam also produced licensed stallion Lancelot Quainton by Lansing. Stem 18B1 counts among the best Holsteiner mare families with representatives including the licensed stallions Constant, Chin Champ, Quality and Quantum. Beauté de la Vie's second foal, Kasalla DKS (Cassini-Lansing-Cor de la Bryère), was sold at the 2017 FENCES Elite Auction, and Beauté de la Vie is currently in foal to Diamant de Semilly. Newer PostHappy New Year! DKS Looking Forward to an Exciting 2018 Foaling Season! Older PostKasalla DKS and Helios Quality DKS Sold at FENCES Elite Auction!